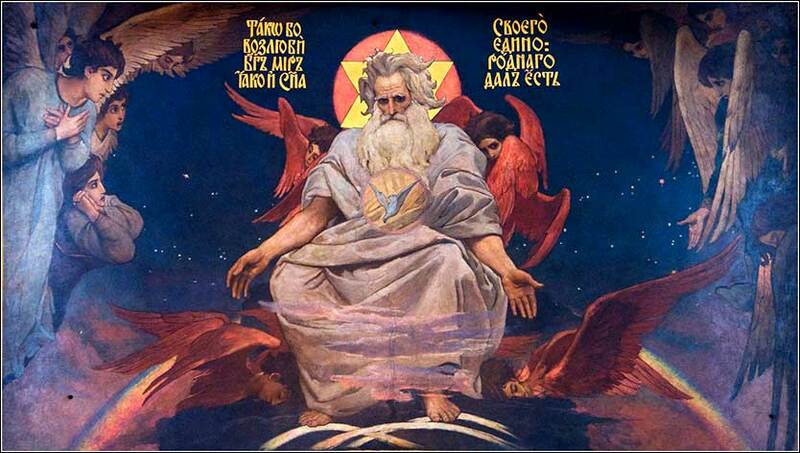 God the Father by Wilhelm Kotarbinski (Polish) ca. 1890. This idiosyncratic imagining of God the Father emphasizes His merciful aspect; notice the rainbow beneath Him, and the dove of the Holy Spirit inset into His chest. The art nouveau angels with red wings are most unusual. This great old hymn (1895) is given a good, somewhat updated sound by the Collingsworth Family. 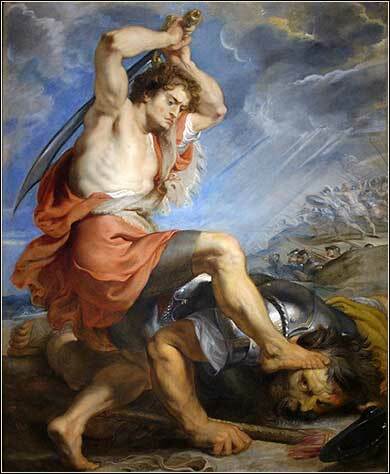 David Slaying Goliath by Peter Paul Rubens, ca. 1616.
you need a break from bickering and griping! Do not remember our past iniquities; help us quickly with your tender mercies, for we have been brought very low. Help us, O God of our salvation, for the glory of your name. Deliver us and purge away our sins, for the sake of your name. Why should the heathen be able to say, Where is their God? Let him be known among the heathen in our sight, by revenging the blood your servants have shed. And return to the hearts of our neighbours seven times their scorn, when they turn it against you, O Lord. We, your people and the sheep of your pasture, will give you thanks forever; we will show forth your praise to all generations. Three of the six verses (8, 11, 13) are very much in keeping with the message of Christ and are a beautiful prayer to God, asking for forgiveness. The phrase 'tender mercies' was used as the title for a good movie, 'Tender Mercies', starring Robert Duvall. (In fact, the movie garnered two Academy Awards, Best Actor for Duvall and Best Original Screenplay, and was nominated for several more, including Best Picture.) It concerns a washed-up country singer with a checkered alcohol-soaked history, estranged from his daughter and ex-wife; he meets a widow who runs a humble motel in rural Texas, very much "wind-swept plains" in the middle of nowhere, and finds redemption. His past iniquities are forgotten and he is able to forgive himself for his past mistakes; he finds salvation and peace, but in a poor ramshackle motel on the edge of nowhere through his love for a widow and her young son, instead of on a glittering stage in Nashville or Houston. The other verses are peculiarly Hebrew. The Israelites are having problems losing battles to heathens, and they ask God to help them for the sake of His name. This might sound arrogant to the modern ear, but it reflects the way in which God had set up His first covenant with the Hebrews. Their blessed status in God's eye was personal and tribal. They identify themselves so closely with God that they believe, unabashedly, that their success in battle will make God look better. It was correct for the Hebrews to believe this, because it was God's will for them to have earthly successes as a sign of His covenant with them. The Old Testament is a constant cycle of the Jews forgetting or ignoring their religious duties and beliefs, God punishing them by invasion or famine or captivity, then a new prophet appearing who leads them back to spiritual correctness, and God then rewarding them with sheep, land, and political supremacy. Although a number of prophets and several other prominent Old Testament figures led ascetic lives, the Christian values of humility, poverty, etc., were not nearly so prominent in the Hebrew theology of the day. Asceticism was practiced more as self-punishment, often as a proxy for the entire nation, than as a theological rejection of earthly wealth.